Custom-designed dental crowns are used to restore a tooth to its original appearance and function. They provide a restorative solution to severely damaged or decayed teeth, dental implants, and root canals. Crowns may also be a permanent foundation for holding bridges and dentures in place. Dental crowns are permanently placed over the entire damaged toothâ€™s structure, which replicates the original toothâ€™s shape, strength, and aesthetics. In addition, crowns can be placed on top of implants to provide functional shape and structure. With proper care, you can expect a crown to last a lifetime. Using our state of the art CEREC SpeedFire machine, weâ€™ll create Zirconia Crowns for you during your appointment! Once ready, we permanently affix your brand-new, custom crowns, and youâ€™ll be on your way with a bright smile again! The CEREC SpeedFire machine has turned what was once a two-week process into a two-hour appointment! This revolutionary technology allows for crowns to be completed chair-side, a convenient and economical solution to a process that use to require multiple visits. 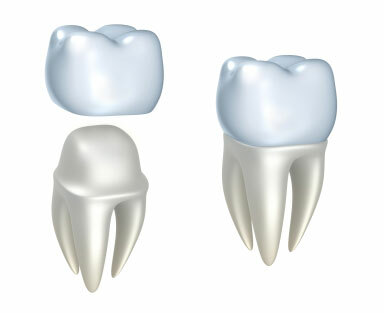 Custom-designed dental bridges are similar to crowns; however, theyâ€™re used to fill gaps in one or more missing teeth. They provide a permanent solution for those who wish to restore their smile to its original luster. When a person has missing teeth, the remaining teeth could shift to make up for the gaps. In addition to being a restorative solution, dental bridges help prevent this shift, or dental occlusion from happening. Your custom bridges will give you a more natural feel and function, so you can get back to your usual routine of eating and cleaning your teeth. Set up a consultation and weâ€™ll help determine the best path for youâ€”whether itâ€™s crowns or bridges!